Bitter gourd is a tropical fruit loaded with minerals and vitamins. 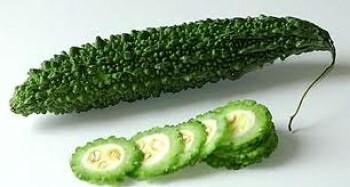 It is recognized by many names , including bitter cucumber, bitter melon and bitter apple. It not only looks ugly according to some people but is gained notoriety for its extremely bitter taste. This uneven textured green vegetable is good for one’s health. It contains a lots of vitamins and nutrients and is highly beneficial for our health. Respiratory disorders: Fresh pods are an excellent remedy for curing respiratory problems like asthma, cold. Cough, etc. Liver tonic: Drink one glass of Bitter Gourd juice daily to heal liver problems. Keep consuming this continuously for a week to see results. Immune system: Boil Bitter Gourd leaves or fruits in water and consume it every day to fight against infections. This also helps to build your immunity. Acne: Consuming Bitter Gourd can help to get rid of acne, blemishes and deep skin infections. It is useful in treating blood disorders like blood boils, scabies, itching, psoriasis, ring-worm and other fungal diseases. The free radicals in it are also useful for anti ageing. Consume juice of Bitter Gourd mixed with lemon on an empty stomach daily for 6 months or till you get the required results. Constipation: Bitter Gourd helps in easy digestion as it contains fibre properties. The food is digested and waste is thrown out of the body which helps in curing indigestion and constipation problems. Kidney and bladder: Bitter Gourd helps to maintain healthy liver and bladder. It is also useful in curing kidney stones. Heart disease: They help to reduce the bad cholesterol levels which clog the arterial walls and thereby reduce the chances of heart attacks. Also it is known to lower blood sugar levels that help in maintaining good heart health. Cancer: Bitter Gourd can prevent cancer cells from multiplying. Weight loss: Bitter Gourd contains antioxidants, which help to flush out your system. This improves your metabolism and digestive systems thus helping you lose weight quickly.